I thought I might get skunked today! The bands seemed pretty dead - and the wind was blowing 20-25 mph! IK2CIO - Vini was calling CQ from Italy. Tried several times and got a 599 report from him - which I suspect was more of a contest style report - but still fun none the less! I worked Vini on 17 meters. AJ8P - Jeff returned my CQ from Sherrodsville, OH. He was very weak, and then someone started calling CQ really close to us. If I cranked up the filter, I would lose him - so just had to suffer through it. Jeff said he was running 2 watts. After I got back to work, I had an email from Jeff. He sent me this picture and said he was using the Mag Loop inside! 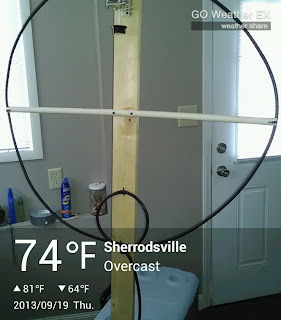 This just makes me want to get one of my loops working so I can start having some radio fun from the comfort of my home. From checking out Jeff's QRZ page, he has a couple nice QRP rigs on his page - worth a visit. After working Jeff, it was time to head back to the office - another fun day with the radio!